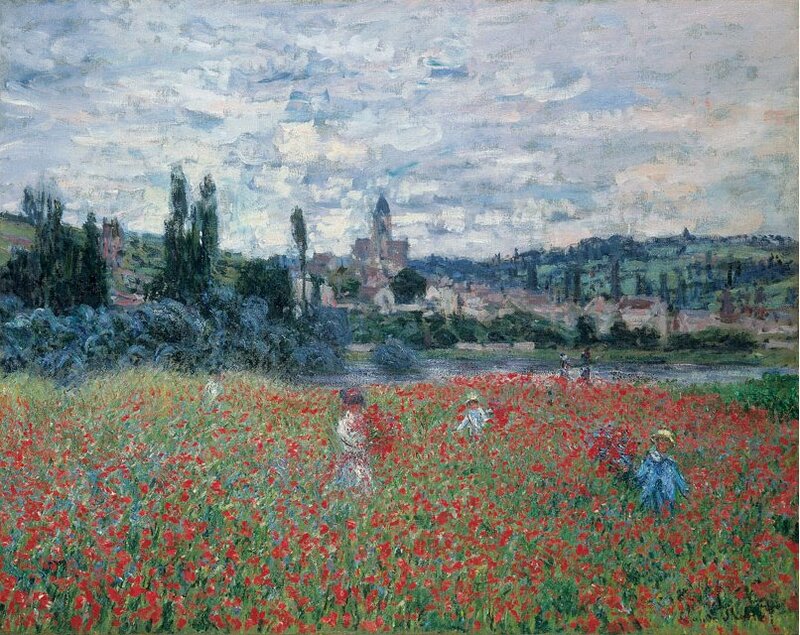 Claude Monet, a painter whose name is inseparable from Impressionism, painted landscapes, water lilies, poplars, ladies in garden, women with parasols, Rouen Cathedral, London Parliament, boats, leisure activities, coast of Normandy, and – poppies. He captured these exciting red meadow treasures in single brush strokes of magnificent red colour, so rich and decadent against the endless greenness of the field. Nature and its changeability was something that really fascinated the Impressionists; their aim was to capture the change of light, the rain, the sunset, the wind and the dew – capture the moment in all its beauty and splendor. 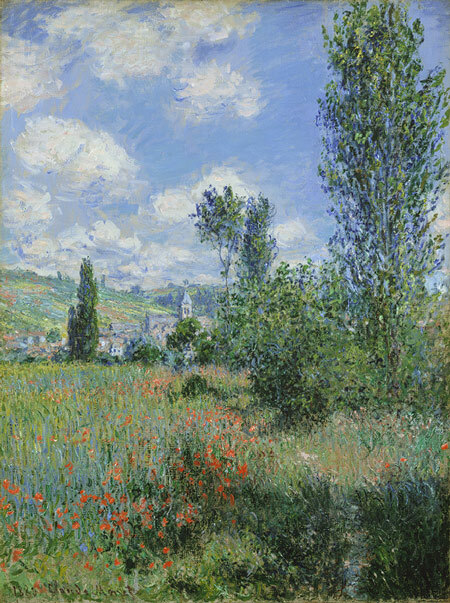 Although born in Paris, Claude Monet, like many other Impressionists, made frequent trips to French countryside, in search for inspiration. Such trips brought him, among other places, to Argenteuil which was, back then, a rural escape for many Parisians. There he painted the gleaming surface of the river Seine and those famous fields dotted with exuberant poppies and other wildflowers. 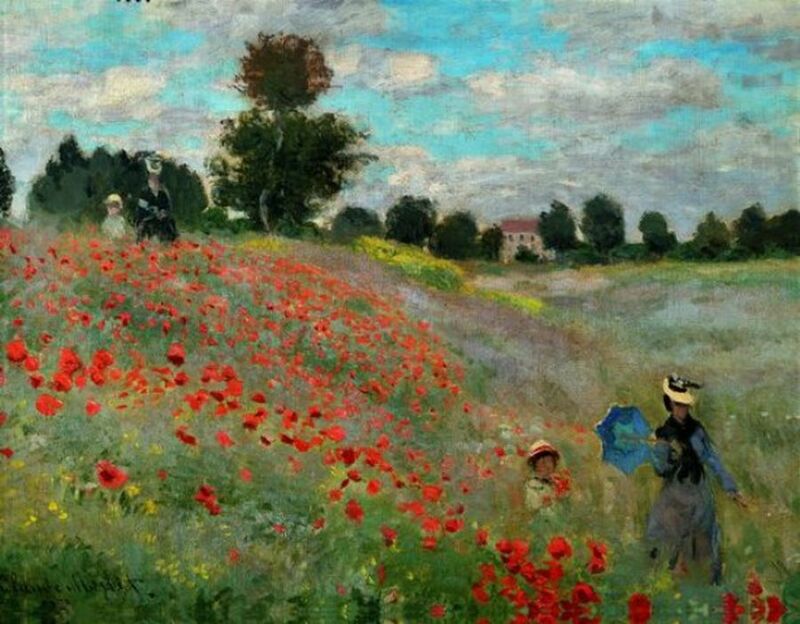 Claude even lived in Argenteuil for some time in the 1870s, and that’s when he painted the interesting painting you can see all the way up, titled simply ‘Poppies’. It is a very simple scene, a beautiful sunny moment captures on canvas. A scene of poppies is framed by a dash of trees and a few peaceful clouds on a bright blue sky. The painting is somewhat symmetrical; motif of a woman and a child is repeated, one time in the background, one time in the foreground, and we can see a diagonal line which separates two colour zones – a vivid red one and a more gentle one, mottled with blue-lilac flowers. 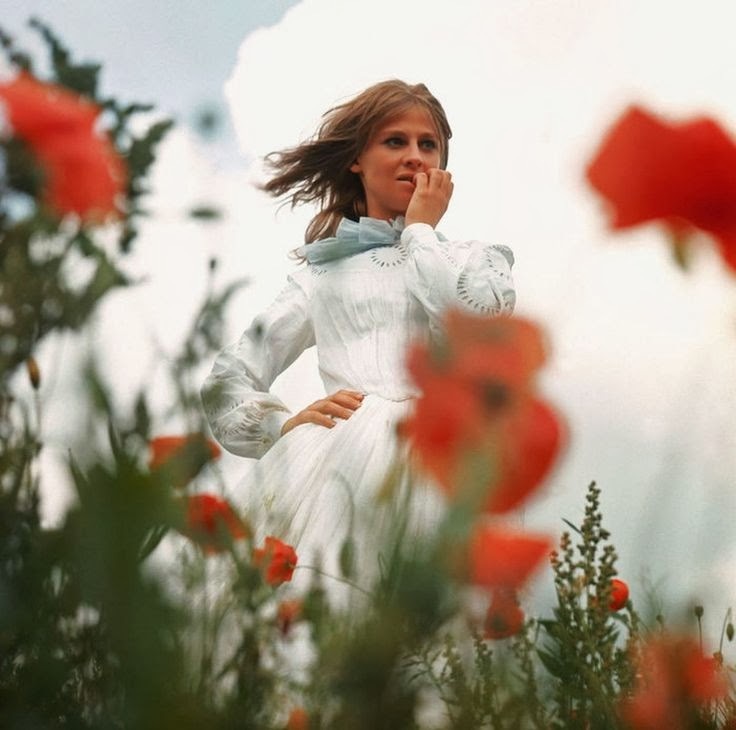 As is typical for Impressionism, colours and lines are blurred, and the woman’s dress in the foreground almost seems to be blended in with the poppies and the grass. The figures are painted dimly, and the overall simplicity rules the scene, but the universal feeling that it projects is what attracts viewers the most; a vivid atmosphere of a summer’s day, a stroll in the meadow, sun shining bright, buzz in the air, the intoxicating redness of the poppies, no worries, no fears when one is surrounded by such beauties. 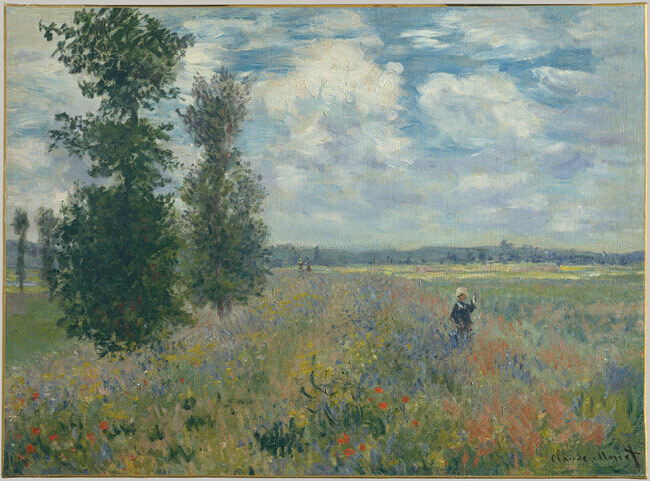 As you can see in the examples below, motif of poppies and meadows never failed to capture Claude Monet’s attention and he seemed to be enjoying his stays at the countryside. After spending time in Argenteuil, Monet moved to Vétheuil, a commune in the northwestern suburbs of Paris. In Vétheuil, Monet found peace of mind after the death of his first wife Camille by painting his garden and the nearby meadows. Vision of poppy as a symbol of sleep was further emphasised in the novel Wonderful Wizard of Oz in which a magical poppy can make you sleep forever if you smell its odour for too long. 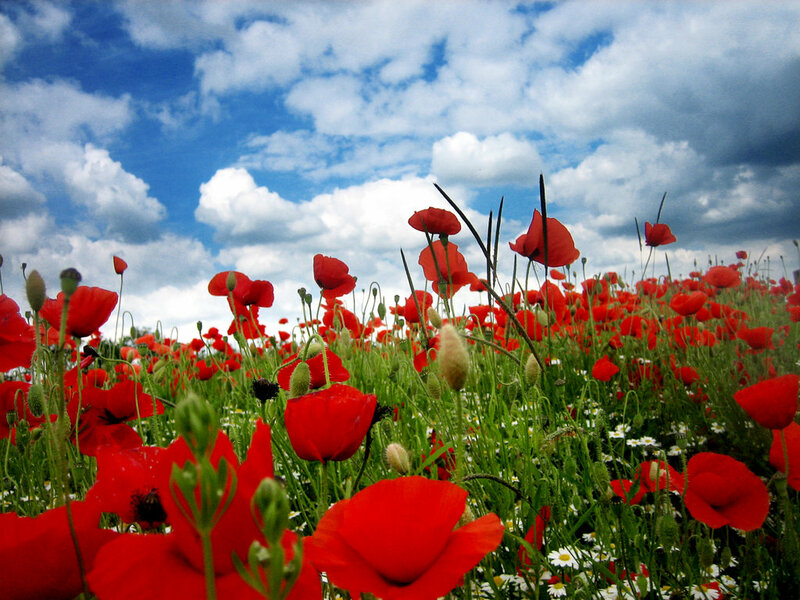 Poppy is also used for the production of opium, and morphine and heroin. Opium was a well known wellspring of inspiration for the Romanticists such as Coleridge who wrote his ‘Kubla Khan’ one night after he experienced an opium-influenced dream. Shelley also used opium to free his mind, so did Edgar Allan Poe and Baudelaire. It’s not a coincidence that ‘morphine’ borrowed its name from the Greek god of sleep Morpheus who slept in a cave full of poppy seeds. 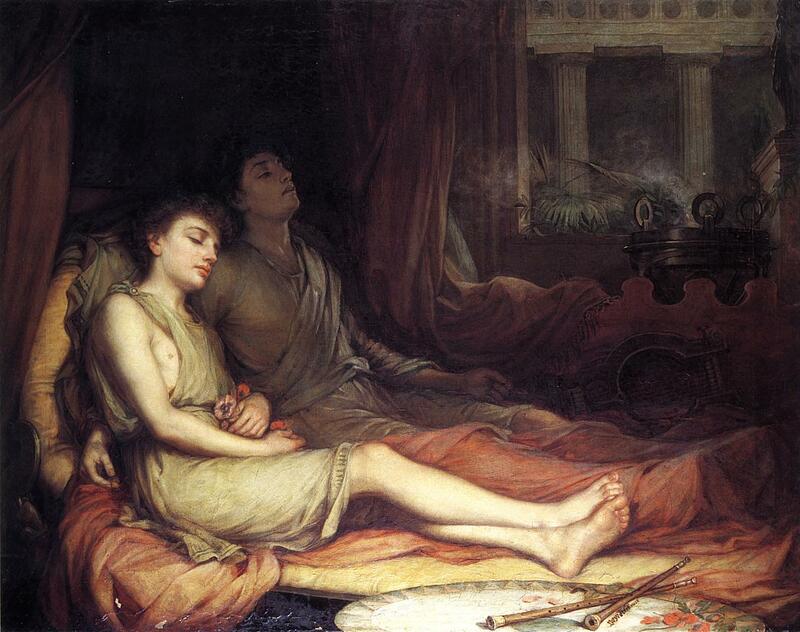 Pre-Raphaelite painter John William Waterhouse seemed to have had similar ideas in mind when he painted one of his early works Sleep and his Half-Brother Death in 1874, in which he portrayed the mysterious connection between sleep, dreams and death. 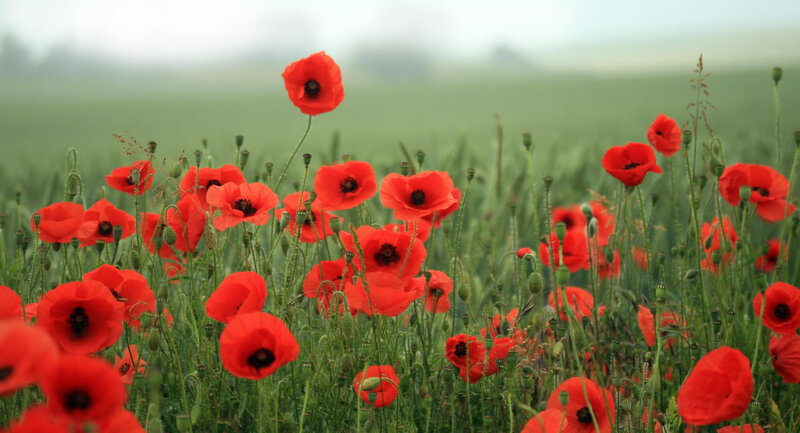 Poppies are also seen as symbol of beauty, magic, consolation, and fertility. In China, they represent the loyalty and faith between lovers. According to the Chinese legend, a beautiful and courageous woman named Lady Yee was married to a warrior Hsiang Yu and she followed him on many battles. During one long war when the defeat seemed imminent, Lady Yee tried to cheer him up and boost his spirits by dancing with his sword. She failed in her mission, and committed suicide. Beautiful red poppies grew on her grave in abundance. Petals of the poppy flower reflect her spirit as she danced in the wind. Poppies in Sussex, photo found here. Poppy is one of my favourite flowers out of many reasons. Firstly, their vivid red colour makes them stand out amidst all the greenery. Secondly, dreams, opium and Morpheus are some things that fascinate me, especially their connection with Romanticism. Poppies always seem to remind me of solitude since they often grow on isolated place. My memory places them by the railway, lost and forgotten, beautiful and fragile, gently dancing on the wind, in an eternal state of waiting, full of secrets, whispers and mystery, like some sad and lost souls that came out of Kerouac’s novel.